We’ve all had those moments… when you get so irritated and angry that you’d rather claw the eyes out of someone rather than speak one nice word to them. You feel heat shooting up through your chest and out of your ears like an overheating locomotive engine. Your eyes bug out, the vein in your forehead bulges like those in the Incredible Hulk, and the hair on your head stands at attention despite the hairspray or tube of hair paste you smeared in it. Your teeth clench like a pit bull and every thought in your head at that moment strikes out like flying daggers from a master black belt ninja. You are mad, and you want everyone, including Facebook and Twitter, to know it! When we are angry the one thing we want is resolution or justice. Rarely do we want to be sweet and even less do we want to pray. However, prayer works and though we can find alternative ways to help our anger, prayer works best. 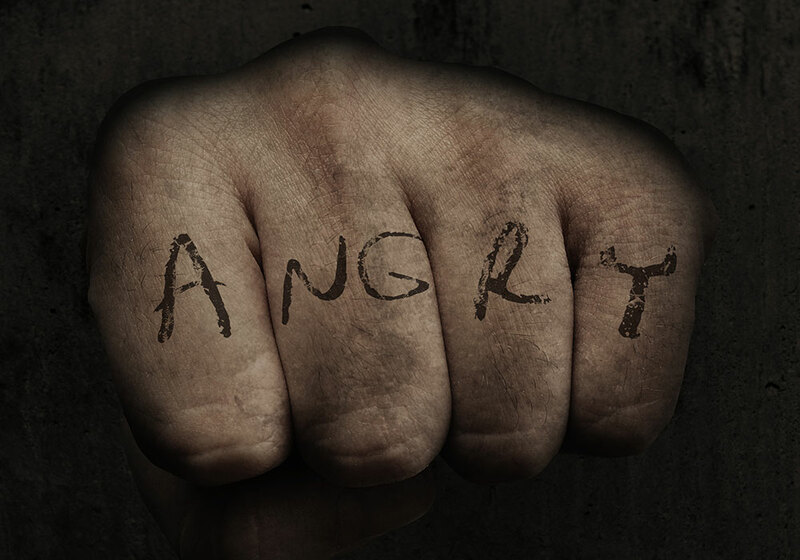 Here are some ways that can help you pray through your anger before anger gets over on you. Breathe slowly…act slowly. When Jesus became angry, he didn’t automatically start reacting. He did an activity that slowed down his actions and calmed his nerves some and gave him proper focus to teach a spiritual lesson. Often when we are angry all we can think of is immediate resolve, which can skew our rational thinking. When the adrenaline is flowing fast, it’s hard to not respond. Slow down. Think about your situation and what you are going to do before you do it. Breathe deep and slow. Pray for God to show you how you should respond. Think about what He would do. Be rational. If you are going to speak at that moment ask yourself if your action are rational, and can help the situation. If they will not help, then don’t do it, or say it. Many arguments and situations are made worse by the way people react in their anger. Saying hurtful words in response will not help. Hitting someone will not help. Doing abusive behavior to that person or to you will not help. Again, ask God how you should respond. Walk away, if necessary, and then come back to the situation when you can think straight. Weigh the problem. Ask yourself if the problem is really that big in light of all of life or eternity. Too many relationships are damaged over small things that really don’t matter. Write it down. If you can’t discuss or address a problem calmly, try to write down your feelings and thoughts. Putting your words on paper is much better than throwing them at another individual. Writing will often release emotions and help us clarify what is bothering us. Emotional responses can be communicated wrong and often one wrong word can permanently damage. After writing down your response, pray for God to help you share what you’ve written in a calm manner. Accept responsibility. If you are partly or fully the cause of the problem, accept responsibility; don’t try to cover it or justify your behavior. Covering your shortcomings doesn’t help anything. Responding in anger because someone addressed a wrong you did won’t fix the wrong or help you to change. We can only change when we accept our fault. Ask God to help you be true and accountable. We all make mistakes but God can help us overcome them when we ask for help. Accept that others make mistakes. None of us are perfect. Give grace to others when they mess up, like you want them to show grace to you. Forgive them, as you want them to forgive you. If you do not forgive, God cannot forgive you. Pray for God to help you to forgive and let go of wrong doings instead of letting it become a bitter poison in you. Tell God you are mad. It’s ok to tell God how you feel, even when you are really mad. Be honest. When we are open, and don’t hold things in, then we can heal and become more rational. Hiding anger will only cause bitterness and a revengeful spirit. Lord, I’m really angry. Things seem unfair and things aren’t right. Right now I want to say things I shouldn’t, or do something to get revenge. I want to scream at the world or at person who hurt me, but that won’t do any good. Please, I need help to deal with this. I don’t want to think these bad thoughts; help me to dwell on the good and the positive things in my life. Help me get rid of this burning inside my heart. Lord, I know to hold anger in my spirit is wrong. I have some bitterness and unforgiveness in me. I’ve reacted wrong to others and said some things at times that I shouldn’t have. I’ve hurt others and not just myself being this angry. I confess this, and ask You to forgive me and take this anger away. Heal any wounds that I have inflicted, through my words and actions, in others and myself. Help me to speak kind words and forgive. Help me to make things right with those that I have been angry with. I ask you to help me think good thoughts. I don’t need revenge; that is your job. I need peace and I want this situation to make me a better person. Help me to learn something from it that is good. As Your Word says; “You will keep him in perfect peace whose mind is stayed on thee.” I will react right. I will make amends. I will not let my emotions control me. I will respond as You did… with love and forgiveness.